Chiller Films delivers another horror/slasher from a decent level. Don’t expect something extraordinary and original. The ultimate story, the setting and the end of “Animal” is already used infinite times and won’t ensure that the seasoned horror buff will raise his eyebrows. The title alone indicates a total lack of inspiration and sounds pretty dull. Although it covers the complete movie and from the outset you already know what you can expect. A bloodthirsty beast that moves amazingly quickly through the forest, making multiple victims. If you’re not really a fan of such movies and you can’t stand gore scenes, you can rest assured, because that is totally absent in this film. Perhaps that’s because Drew Barrymore was the “Executive Producer” and has ensured that the rough edges were smoothed. You’ll get a lot of cliches as you encounter them often in these movies. Again there’s a group of people who are planning to carry out an elated and relaxed recreational pastime and then accidentally get stuck again after which they are being hunted by an unknown creature. The group is also a collection of colorful characters, each with their qualities and shortcomings. Also you can expect a car that won’t start, splitting (always a bad idea) of the group, stumbling people with some disastrous consequences, a villain who acts out of self-interest and stupid decisions. Ultimately this horror/slasher is not that bad, despite it follows paths that are walked on already before in this genre. You see from afar how it plays out. But it’s brought quite good and there’s no “found footage” crap. No annoying swaying images so you become miserably seasick. It all looks exciting and menacing, and it’s edited in a solid way so you get a blazing-fast whole and you won’t be bored for a second. And in spite of the fact that it’s mostly filmed at night, the image quality is still acceptable. So in terms of production, it’s successful. The only thing this film lacks is originality. There’s nothing new to discover in this film. Even when the group enters a wooden cabin that has been converted into a fortress and where there are three other persons hiding. We saw a glimpse of them in the beginning of the film. These people cause a crucial development, but won’t provide an original twist. I read somewhere that this looks actually like a kind of “Feast” situated in a forest. I’ve never seen the latter, but judging by the cover of this film, I know what inspired the creators of this movie. Despite that the monster sometimes looks like a guy walking around dressed up like a monster, the close-up shots were successful and terrifying. Granted, it’s not a “Predator” or “Mother” from “Alien“, but at least it looked better than the teddy bear on steroids in “Evidence“. Especially the impressive row of sharp teeth looked realistic and are clearly designed to tear up a victim into shreds. There were also some illogical things. The fact that some simple shelves,cabinets and doors pushed against a window could keep out the creature, was a bit absurd. And why didn’t they use the canister again after it was proved to be effective? Also unfortunate was the lack of any explanation of the origin of the creature. Was it alien? Was it created by a chemical substance? Was it a military project that has gone wrong? There is no statement on the matter. Not that this is necessary. But it would be an interesting addition. 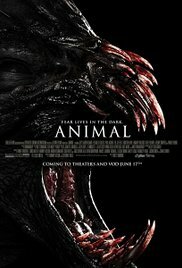 Conclusion: a typical monster movie with a cleverly written script that still has a surprising twist or two. It’s also directed by Brett Simmons who directed “The Monkey’s Paw” in the past. It’s a movie for fans of this genre and it’s definitely worth a look.